Below are the complete details of the Supervisor jobs in Chip Training & Consulting Private Limited in Multiple Cities. Skills Required for Job: Candidates must have Good Communication Skills. Good Team Working Skills. Communication. Conflict Resolution. Critical Thinking. Time and Priority Management. 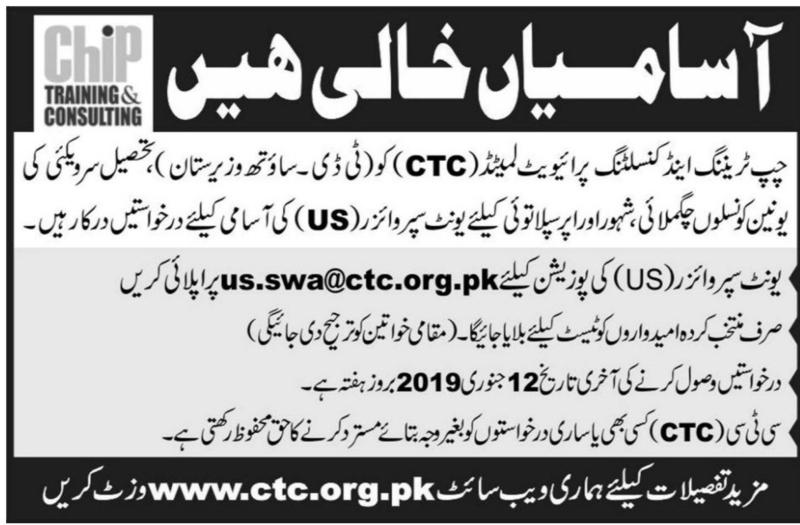 Qualification: Chip Training & Consulting Pvt Limited Pakistan Jobs For Supervisor. Attractive Salary Package. Last Date for Submission of Application 12th January 2019. Supervisor jobs in Chip Training & Consulting Private Limited Multiple Cities in Pakistan published on Paperpk.com from newspaper on January 08,2019. Job seekers who are already working as Admin Supervisor , Supervisor , Project Head Supervisor , Quality Control Supervisor , Floor Supervisor , Mechanical Supervisor , Production Supervisor , Maintenance Supervisor , Civil Supervisor , Security Supervisor can also apply for post of Supervisor.